As most holidays in Greece revolve around food, Greek Easter is no exception! These are the days when households are preparing delicious meals for the Easter Sunday and making all these delicious traditional Greek recipes, like lamb, kontosouvli, magiritsa, dyed Greek Easter eggs, tsoureki and of course these amazing Greek Easter cookies (koulourakia). Greek koulourakia recipes are characterised by a butter base, shiny egg glaze (which makes them beautifully golden brown) and various rising agents to make them fluffy and airy. Nowadays most koulourakia recipes call for baking powder and baking soda, but experience has shown me that nothing compares to the traditional koulourakia recipe, which calls for baking ammonia. Ammonia makes the koulourakia amazingly airy and crunchy and compared to other rising agents, the crispness will last longer. This is an old fashioned traditional Greek koulourakia recipe for you to recreate this delicious traditional delight from scratch! Oh and you can always read this delicious recipe in Greek here Αφράτα Πασχαλινά κουλουράκια με αμμωνία. To prepare this traditional koulourakia recipe, start by mixing the butter and sugar. In a mixer’s bowl add the sugar and butter (chopped) and mix for about 10-15 minutes, until the butter is creamy and fluffy. (Once starting to prepare this koulourakia recipe, make sure that the butter is at room temperature). In the meantime warm the milk until lukewarm and remove the pot from the heat. Add the ammonia and blend until dissolved. Set aside. Add the eggs (in the butter-sugar) mixture one at a time, whilst mixing, allowing time for each one to be absorbed, before adding another. Pour in the the vanilla extract, the orange zest and milk (with the ammonia) and mix to combine. Add the flour, a little bit at a time, whilst mixing, until the ingredients are combined and the dough is soft and not too sticky. Cover the dough for the koulourakia with some plastic wrap and set aside to rest for 20 minutes. In a small bowl add the egg yolks and 1 tbsp water and whisk with a fork. Brush the top of the koulourakia and bake in preheated oven at 200C for 15 minutes, until nicely coloured. Let the koulourakia cool down completely and store in airtight containers for up to three weeks. Are you trying to kill us with the ammonia? What is the meAsurement of one glass in cups? Also why no baking powder or soda. The ammonia is enough for them to rise? never mind I see your recipe uses cups. I will try this today! thanks for this recipe! Elli, this looks divine! I cannot get the ammonia in time to bake these can I just use the same amount of baking powder? Just replace the flour with self raising flour and skip the ammonia altogether. No need to use anything else. The cookies did not look like the pictures , they were a white color , any suggestions . I baked them at 400 degrees, second rack from bottom . Maybe they needed a little longer in the oven.. Did you use the egg to brush them over? The amount of ammonia was changed recently. Any reason why? Made these kouloria also with self raising flour everyone loved them love your recipies! Mine were white and also very hard and threw them out. Made another batch with self raising flour, with no ammonia & no baking powder and they were perfect. When you say hard, do you mean very crunchy, or tough?? Thanks! Made these last night and they were the best I’ve ever made thanks for the recipe. Have tried several recipes over the past years and this is definitely a keeper. Did you stick to the recipe exactly, or swap out the flour for Self Rising? I’m about to bake these in a little while, and would like to know. Thanks! Can you tell me how much baking powder or soda to use in place of the ammonia? Eli, I have been searching for a recipe like this for a long time. Finally I found it. My family when crazy over them. Brilliant recipe and so easy. I did make it with the SR flour. I didn’t have any oranges so I put a little cinnamon. Delicious!!!! Thanks Eli! Made them over the weekend using self raising flour and they turned out to be perfect. Thank you for such an easy and perfect recipe! Your recipe is good , but where I come from in no way do we use orange juice or zest for Easter koulouria , there is a *portokali* koulouri . I plan to use self rising flour. Do I eliminate the milk too? Or just the ammonia? How much self rising flour would you use and what ingredient do you replace with? I noticed many using self rising flour but what did they skip? If I use the self rising flour…. Do not still use the milk???? Hi, what is the measurement for sugar in grams please and the milk in mls? I followed the recipe but the dough became crumbly with the amount of flour specified. What did I do wrong? Probably your flour was a little stronger than what I used when making the recipe – next time try adding the flour a little at a time and keep an eye out for the texture of the dough. If it gets too hard stop adding flour. If you’ve added too much, try adding a bit more butter to soften the dough. Pingback: That's a lot of loukaniko: Fresno Greek Festival by the numbers - FresYes! When rolling the dough into ropes, how thick should the ropes be? What diameter? Just wondering if i can substitute the milk with orange juice? I am planning on making these for my (Greek) Father in Lae for Easter. I have managed to track down the baking ammonia so I hope they taste as good as his Nona used to make. 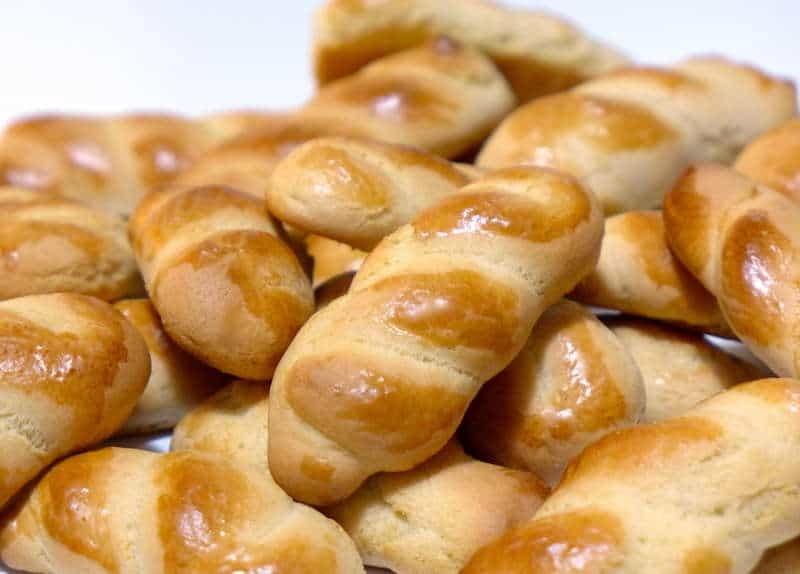 My question is what is the traditional shape of a koulourakia or isn’t there one? i made the other day and im not greek…i accidently used wholemeal plain flour and used baking powder they taste good but are a little dence… i did the ropes but they turned out like pretty large buscuits… is there a particular share or size they need to be? Can I make and refrigerate the dough the night before and roll them in the morning?